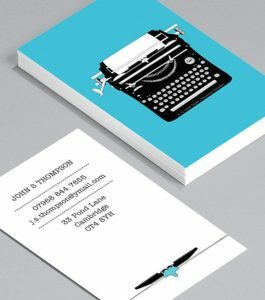 Business card providers make it quick and easy for you to design and print your own business cards, either using your own design or by choosing from a pool of templates. We looked at the most popular options and rising stars and decided to review Vistaprint, Moo, and Jukebox. These companies covered the range of options for small businesses in terms of price, available designs, and turnaround time. We recommend Vistaprint as the best business card provider for small businesses. They offer over 10,000 templates and the option to easily design online yourself OR get help from a professional designer. They are also affordably priced with a good turnaround time. Pro Tip: Before you spend money on a professional business card, make sure everything on it is professional, including your email address. Nothing makes a customer lose confidence like seeing YourName@gmail.com on your business card. Learn how to get a free professional business email address here. 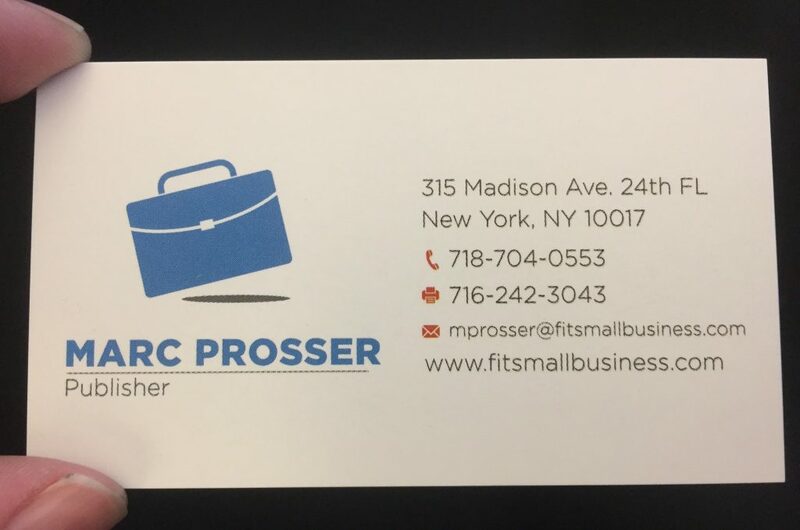 We think Vistaprint provides the best business cards for small businesses because they offer the best combination of variety, quality, and cost. With over 10,000 different templates available, you’re sure to find one that fits your business’ aesthetic — and once you do, they’re easy to customize through the website’s user-friendly design tool. Vistaprint will also save any customized design to your account so that they’re easy to re-order in the future. In fact, we like Vistaprint so much that we use it ourselves at FitSmallBusiness. 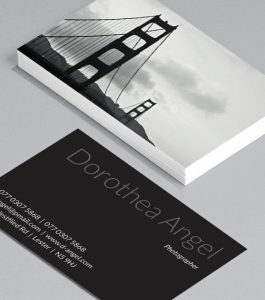 Vistaprint offers a large range of business card design templates with a good selection of card treatments and finishes, all for a very reasonable price. With over 8,500 templates to choose from, Vistaprint offers far more variety than both Moo and Jukebox — combined. If Vistaprint’s templates aren’t quite enough, the online design tool is user-friendly and allows you to easily add your own text, upload stock photos, and customize background textures and colors. Standard cards start from $9.99 for 500 cards, plus delivery and processing costs. This is less expensive than both Moo and Jukebox. There are also a good variety of paper stocks and finishes to choose from in the premium package – you can choose a matte or glossy finish and opt for recycled stock if you wish. Specialty accents such as foil finishes and magnetic backgrounds are also available at an additional cost. We recommend Moo as the best business card provider for high quality business cards. Their professional design and printing service comes at a premium cost, but the results are exceptional. If you want to present the best possible image for your business and your budget allows it, look to Moo. 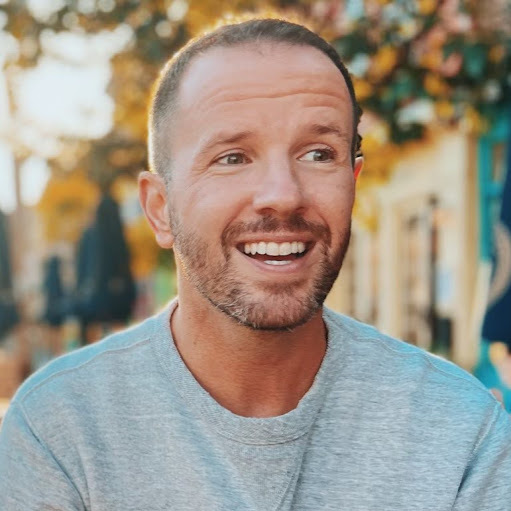 Moo’s primary difference is their innovative Printfinity technology, which allows them to print a different design on individual business cards within the same batch. For example, you can print different cards with their own targeted image for different leads or simply present your portfolio or product range on groups of cards. Also of interest is Moo’s ability to embed near field communication (NFC) technology into their cards. This allows you to transmit the contact information on your business cards to enabled devices, such as smartphones or tablets, with a simple tap of the card on the device. This means your prospects will already have your information stored in their phones, and there is no risk of them losing your information if they misplace your card. Moo also boasts a library of over 1,300 design templates, which, while fewer in number than Vistaprint, are of significantly higher quality. All of them have been created by professional designers, are highly customizable, and have a modern aesthetic that’s missing from many other service providers. We recommend Jukebox as the best business card provider for unique business cards because of their range of cardstock options. They offer options that include materials such as wood, silk, cork, sparkle, or bamboo plus a variety of different shapes. 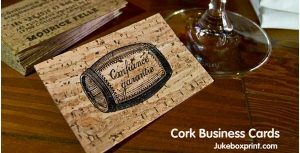 Choose Jukebox if you really want to make a statement with business cards that people likely haven’t seen before. The downside is that Jukebox is not as easy to use as Vistaprint or Moo, so if you’re looking for a standard business card you should probably go with one of the other two options. View more unique cards that Jukebox has created here. Material — One choice you’ll need to make is how thick you want the card to be. The thicker the card, the more you can expect to pay. You will also pay more if you want the cards printed on an unconventional material, such as wood, cork, or bamboo. Custom Finish — There are different finishes you can add to your card to make them stand out. Your cards can be shiny, matte, or metallic depending on the impression you want to create. Design — Expect to pay extra for a custom design. You will sometimes pay more for color as well, though Moo and Jukebox both include the cost for full color in their prices. Shape — If you want to stand out with an unusually shaped card, you will be charged extra. Some services, such as Vistaprint, don’t offer sizes other than the standard rectangle. Quantity — Obviously, the more cards you purchase, the more you will be charged. However, your cost per card will decrease the more that you order. Printed Side — Vistaprint charges $5.24 – $5.99 to print on the back. Moo and Jukebox include printing on the front and back in the cost of their cards. Shipping Time — You will pay more for expedited shipping. All of the options offer a wide range of pricing depending on how many add-ons you want for your business card. Vistaprint offers the lowest cost option, while Moo and Jukebox are both higher end. Vistaprint: Vistaprint is one of the least expensive business card providers on the market. You can get 500 fairly good quality cards for just $14.98 (including shipping). However, we suggest spending a little extra to get the higher quality cardstock, which will cost around $11 more. This extra fee is worth it if you want your business card to look and feel professional. The lower cost options feel pretty flimsy. While printing on the front side of your card is included, you will have to pay a small fee of $5.24 – $5.99 to print on the back of 100 cards. Another point to note is that Vistaprint is almost always running a special or promotion, so make sure you have a discount added before checking out. Sometimes they will automatically apply the discount for you, or you can click here to get 500 cards for $9.99. Moo: Moo is more expensive than Vistaprint because you are paying for higher quality cards. The standard cards (3.5” x 2”) cost $19.99 for 50, or you can order the mini-cards (2.75” x 1.1”) at $19.99 for 100.With Moo, full color printing on both sides is included in the price of the cards. Even better is that their printfinity option is also included. This means there’s no additional cost to use a unique image on the back of every business card. Jukebox: Jukebox prices their business cards based on how quickly you need them, giving you the option of “wait and save cards” and “same day business cards.” Full color on both sides is included, and you can also choose between a gloss or matte finish. For business cards that are made out of regular paper and are standard (3.5” x 2”) size, Jukebox charges $59 for 500, which is more than Vistaprint, but slightly less than Moo. If you want your card to be made out of a more unique material such as wood or cork, expect to pay $100-$300 more than the paper cards. 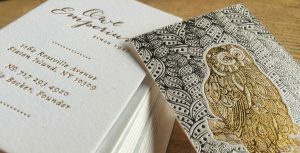 As a small business owner, it’s not likely that you’re looking to design your own business card. That’s why most business card providers offer templates, so that you can choose from premade options and then simply insert your own information. Vistaprint: Vistaprint has over 10,000 templates to choose from, much more than either Moo or Jukebox. 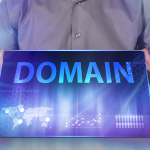 You can search their database of templates using keywords that are related to your business or you can choose to browse templates based on industry. Although their templates are not the most creative, you’re still likely to find a simple, sleek card that will work well for your type of business given how many options there are to choose from. Moo: Moo offers over 1,300 templates to choose from that are created by professional graphic designers. When you browse through the templates, you’re able to see a picture of the person who designed the template as well as their bio. You can easily make small changes to the designs, such as switching fonts or changing the color, or you can create your own design using Moo’s layouts as a base. 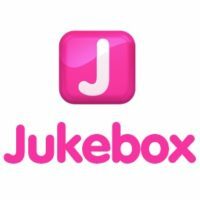 Jukebox: Jukebox has the fewest number of templates, with over 120 to choose from. These templates are not as aesthetically pleasing as Moo’s professionally designed templates, but you will still probably be able to find something that works for you. 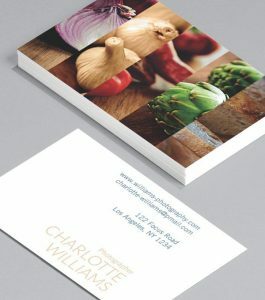 If you want a business card design that is completely unique to your business, or you don’t like any of the premade templates that the services provide, you can have a custom design created. All three options allow you to upload your own design and Vistaprint and Jukebox both offer their own design services. Vistaprint’s option doesn’t include a full custom design, so we suggest using a third party designer. Another good option is to hire a professional designer using DesignBro, which hosts competitions of between 3-10 designers to create a suite of unique and creative logos for your business cards. In addition to providing business card design, DesignBro offers logo design as well as letterhead, envelope & compliment note/slips design services all in one package! Click here to get started with a logo design competition from DesignBro. Vistaprint: Vistaprint offers graphic design services for $5. For this low price, don’t expect them to create a completely custom card for you from scratch. Their service is more to take your current design to the next level by changing the color or layout or to recreate a business card that you like but don’t have the files for. They also offer a logo design service for $90. You can learn more about Vistaprint’s graphic design services here. Moo: Moo doesn’t offer graphic design services for a custom design. However, their templates are very customizable and they let you edit the layout, fonts, and images. Also, since their templates are created by designers, they are already very visually appealing and you should be able to find something that fits your business from their selection. However, if you want something different, you can hire a third party designer from Fiverr or 99designs. Moo then allows you to upload the design into their system. Jukebox: Jukebox boasts high end business card design from top talent from around the world. You can submit an online request form for a custom design, and you will be sent a quote to approve. If you approve, then the designer will send you a design to review and make comments on. Design consultations with designers cost $45 for 30 minutes, which includes two rounds of revisions. Though they don’t mention the cost for a custom design on their website, you can read about the experience one customer had using Jukebox’s custom design service. As a small business owner, it’s important that the websites of these business card providers are easy to navigate. Otherwise, it could take you an unnecessary amount of time to complete a simple task such as ordering business cards. Vistaprint: Vistaprint is very easy to use and understand. You can choose from a variety of templates. edit the text, and upload images through the system. They also provide 3D looking proofs that are true to size, which gives you a really good idea of how the cards will look once you receive them. This helps to make sure everything is sized correctly and easy to read. Vistaprint also saves your previous orders so you can quickly retrieve and make small adjustments to cards you’ve ordered in the past. This is great if you have a larger team and you want everyone to have uniform business cards. The only annoying thing is that Vistaprint will try to sell you on a variety of their other products, such as card holders, pens, etc. when you’re trying to checkout. This delays the checkout process, but doesn’t affect the user experience otherwise. Moo: Moo is also really easy to use and they have a really clean looking platform where you can edit your cards. While going through the process, the website has cute transitions and there are jokes here and there that make creating the card more enjoyable. While checking out, Moo alerted me that something seemed off with my order. It noticed that I hadn’t altered the placeholder text that they use in the templates. For this and many other reasons, it’s clear that Moo is a really well designed and smart website, which makes their business card creation process very easy and intuitive. If you are making edits to one of their templates, you’re able to see how the finished card will look as you are making the changes. Jukebox: Jukebox is a little more difficult to use than VistaPrint and Moo. It’s not quite as intuitive and is harder to navigate. For example, at first it seems that you have to purchase the cards before you can see a proof. However, if you go to the “templates” section, you will be able to design your card using their templates or your own and download a proof. This differs from Moo and Vistaprint, which both have a “get started” button that walks you through the complete process without having to jump around the website. A lot of times, small business owners don’t think to order business cards until there is an event or trade show coming up. If you need last minute business cards, the good news is that you can get cards made pretty quickly. The bad news is that you can expect to pay a premium for express shipping. Vistaprint: The fastest Vistaprint shipping option promises to deliver the cards in three business days for $19.99. There least expensive option takes eight business days and will cost you $4.99. Moo: Moo can deliver your business cards before 10:30am the next day, as long as you order before 2pm EST. The shipping cost to do this is $54.75. If you can wait a week, your shipping cost goes down to $9.75. Jukebox: Jukebox has same-day business cards available, but to take advantage of this fast turnaround time you will need to be located in Vancouver to pick them up. If you’re not, you will need to pay from $25 to $130 for next-day shipping. With this option you can choose from a limited number of their products and expect to pay around $50 more for your cards (on top of the $25 to $130 for shipping) if you want them to be ready the same day. If you can wait, the standard option takes 6-10 days to create the cards plus 1-7 business days (depending on the option you choose) in shipping time. Standard shipping costs $13. Being able to chat with a customer service representative is a nice feature that all three options provide. 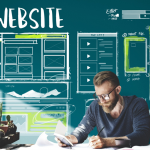 I will say that the websites are fairly easy to navigate, but if you are having trouble creating your business cards then all three options provide phone, email, and chat support. 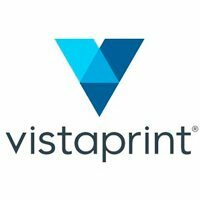 Vistaprint: Vistaprint offers 24-hour email and chat support and their phone hours are from 7:00am to midnight EST, Monday to Friday, and from 8:00am to 6:00pm EST on the weekend. 7am-Midnight (M-F) and 8am-6pm (Sa-Su). Moo: Moo offers 24-hour chat support and promises to respond to emails by the end of the following business day. They are also available for phone support from 3:00am to 9:00pm EST, Monday to Friday (excluding public holidays). Jukebox: Jukebox offers 24-hour chat support and will respond to any emails within eight hours. They are also available for phone support from 6:00am to 5:30pm PST, Monday to Friday. Phone support is also available in French and Spanish. We recommend Vistaprint as the best business card provider for affordable and professional looking business cards. While they may not be of the same quality as Moo or offer the same unique features as Jukebox, they do offer the best combination of quality and price with a website that’s easy to navigate and design tools that are intuitive to use. If you want some inspiration for designing your business cards, be sure to check out these 25 Business Card Design Ideas. The comparison between Moo and Jukebox deserves more investigation. In an apples to apples comparison (ie, not including some of the higher end finishes from Moo) I think the comparable quality and stock options puts Jukebox ahead. I’ve ordered some gorgeous looking cards from Moo that have peeled and delaminated within a couple months, so I can’t justify ordering small quantities of premium cards given the cost per card. Thanks for sharing your experience. That helps our readers discern value for price. Hold Up! You forgot a great one for small business printing. I’ve used Low Cost Print Shop for Business Card Printing, business stationary printing and even large format vinyl graphics printing. Prices are slightly higher than your cheapest printers, but make up for that with their vibrant photographic quality. 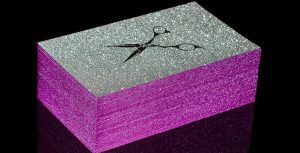 They have business card templates that can be customized online or you can submit your own full color print ready files. Best of all they truly stand up to their name… everything has a low cost price point. Wow! Great information. I normally prefer to design my cards with the help of illustration given on the online websites. Its very useful to make a brand new attractive business cards. A wonderful source of inspiration indeed. Thanks for sharing my friend! Thanks for the wonderful informative article you wrote, few days back i ordered few cards from vistaprint and it was cool and effective way to get such unique design cards. Thanks for sharing the article. keep writing and keep smiling always. I had a sample from Moo within the last month and the quality is excellent. In contrast my dad gets his from Vista Print and the quality is worse but they do regular offers for cheaper cards – lower contrast, thinner card, washed out colours, etc. Yes, I agree that Moo is higher quality, but also higher cost. We get our cards from Vistaprint and feel that the quality is fine for our needs, but if you want premium then go with Moo. We did the work and scoured YouTube to find the best ones available. All you gotta do is click and watch.